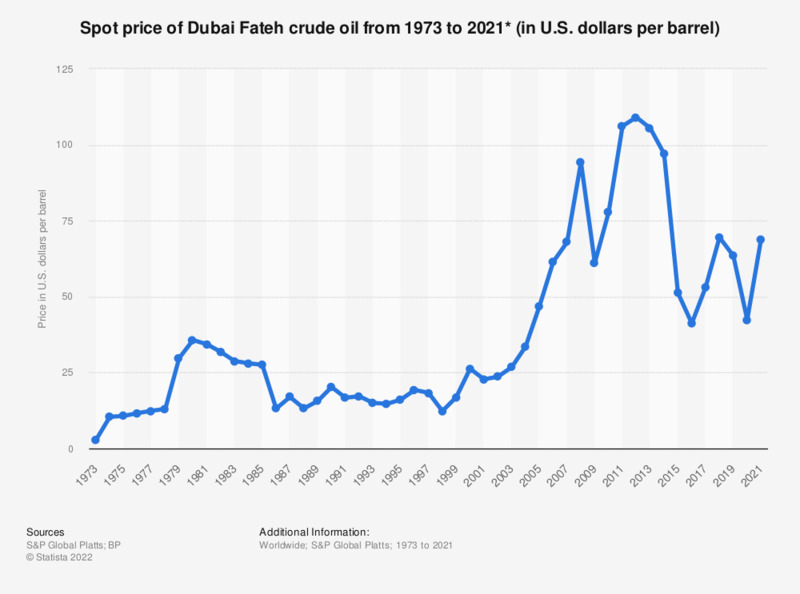 This statistic shows the annual average spot price of Dubai Fateh crude oil from 1973 to 2017 (in U.S. dollars per barrel). In 2017, Dubai Fateh had an average price of 53.13 U.S. dollars per barrel. Dubai Crude (Fateh) is the most important crude oil benchmark for Asia. Dubai Crude originated in Dubai in the Persian Gulf. Another name for this crude oil is Fateh. The name Fateh comes from an offshore oil field, located some 60 miles from Dubai, and is, therefore, part of the United Arab Emirates. One of the advantages of Dubai Crude compared to other Persian Gulf crude oils, and a main reason why it is used as an oil marker, is its instant availability. Dubai Crude, behind West Texas Intermediate (WTI) and UK Brent, is one of the lighter crude oils. On the other hand, Dubai Crude contains some two percent of sulphur, and thus is part of the so-called sour crude oils. In comparison, UK Brent contains 0.37 percent of sulphur, which means it is a so-called sweet crude oil. The refining of sour and heavier oils is always more expensive than it is for sweeter and lighter oils. Dubai Crude, the same as OPEC oils, is mostly refined and traded in the Asian region. The other two crucial oil benchmarks are West Texas Intermediate (WTI), which is especially important for North America, and UK Brent (Brent Crude), which dominates the European oil market. Such benchmarks are essential for referencing the many types and grades of oil on the worldwide market. With the exception of the years 2009 and 2010, there was a stable increase in the price for one barrel of Dubai-Fateh crude oil in the last ten years, until 2015, when the price dropped by half. The mean price per barrel stood at approximately 24 U.S. dollars in 2002. By 2012, this price had increased to more than 109 U.S. dollars, but dropped to 51.20 U.S. dollars per barrel 2015. * 1976-1985 Arabian Light, 1986-2016 Dubai dated.